We had the fun of enjoying Brad and Georgie's Irish hospitality this week as we spent a few days with them in Greystones, which is on the Irish Sea just south of Dublin. Brad teaches at the Christ for Ireland Training Centre. He invited me to come teach a class on Old Testament Narrative as part of a course he is leading. When he listed some possible dates for our trip, it was obvious that we should spend St. Patrick's Day in Ireland. He kindly invited Crystal and Ellie to come along and so we decided to make a holiday of it. 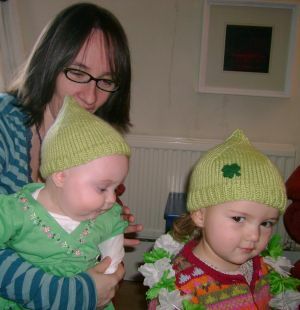 We hadn't had a chance to meet Brad and Georgie's baby, Molly, yet, so Crystal decided to put her new knitting skills to work by producing two green "gnomish" hats (with bells!) for the occasion. We arrived after dark and didn't look around too much before going to bed. When Ellie was the first to wake up (what else is new....) she wandered over to the window and excitedly said, "Water, water, water!" "Sure, Ellie, go back to sleep...." But when we finally looked out the window ourselves, we saw an amazing green sea filling up the entire view — a stunning view from our third story vantage point. It was great fun leading Brad's class. We had four bright and engaged students so there was plenty of interaction over the three hour (!) session. We looked at the story of David and Bathsheba (2 Samuel 11 — a classic example of Hebrew narrative artistry) and Moses' retelling of the Golden Calf story in Deuteronomy 9-10. On St. Patrick's Day itself, we headed over to Daniel's house (he's the principal of Brad's school) and had the unique experience of breakfast, Irish style. We're told that it's known as an "Ulster Fry" and fried it was -- fried eggs, fried bacon, fried sausages, fried tomatoes, fried bread, another kind of fried bread, fried corned beef thingies, and lots and lots and lots of it. It was boisterous. It was filling. It was crowded with both adults and children. It was unforgettable. After breakfast was the Greystones St. Patrick's Day parade. It's a small town, so much of the parade was local businesses driving their trucks along with green, white, and orange decorations. The local coast guard was represented, along with civil defense, police, ambulance and fire trucks (Ellie thought the sirens were too loud!). There were lots of dancers, karate teams, boy scout troops, bands, and anything else you could name. 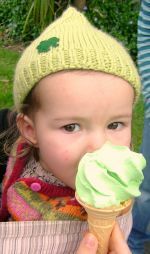 And yes, they had green ice cream — much to the delight of both Barrett girls. My personal favorite was the pipe and drum band. Thanks for a fantastic weekend, Brad, Georgie, and Molly. Our guest room is usually available if you want to relax in calm and reserved England for a few days. Over Christmas, Ellie discovered Aunt Dana's alphabet refrigerator magnets. She quickly learned M is for Mummy, D is for Daddy, E is for Ellie, and G is for Grandma and Grandpa. So Crystal bought her some letters of her own for our Durham fridge. Since the fridge doesn't provide orientation — the letters rotate all which way, making M and W, Z and N a bit confusing — I wrote out the letters for her the other morning. When she was bored with that, she took her marker and drew a circle, which I thought would turn into another cat. When I asked her what it was, I thought she said, "Rabbit" (figuring out her words can be a bit tricky...). So I handed her an orange marker and said, "Why don't you draw some ears on the rabbit?" She paused, "Ummmm....," looked around, and then added some decorations to the appropriate letter. I spent a day in Sheffield this week as part of a postgraduate exchange between the Sheffield and Durham theology departments. The focus was on New Testament, so I tried to fake a little knowledge of Greek here and there. While the discussions were interesting (postcolonial reading of Flavius Josephus' Against Apion anyone? ), the most amazing thing was the discovery of a new gadget. Well, not exactly new....rather old and on the way out, actually, but new to me. Presenting...the "Paternoster." I'll wait while you read the Wikipedia entry on it. Back so soon? Well, basically, as Hector described it, it's an extremely steep escalator. Vertical, actually. There are two elevator shafts, but instead of elevator cars there is a continuous stream of platforms slowly going by each floor. No doors. No stopping. Just jump in and jump out. Try not to get decapitated in the process. I asked if they had ever lost a graduate student. The reply: not any that we cared for. An intriguing mystery was what happens if you forget to get off on the last floor on either the way up or the way down. The sign in the back of the paternoster made it even more mysterious: "Overgoing the loft or the pit is not dangerous....but not recommended." That required further investigation. I won't spoil the surprise by telling you what happened. By the way, you may recognize "Paternoster" as Latin for "Our Father," thus referring to the Lord's Prayer. This seems to be less for the fervent prayers offered by riders for survival and more for the similarity between the Paternoster and a rosary. On a different note, here are the crocus again, now in full bloom. 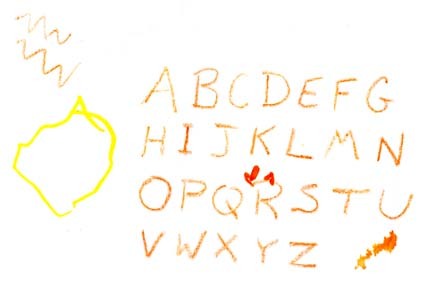 Ellie surprised us over Christmas when she started drawing real things instead of just making fun, nondescript marks. (We'll let you decide for yourself where she is on the standard childhood development charts). Trying to make out the final pictures isn't nearly as much fun as watching her go through the process of creation, so here's a video for you. 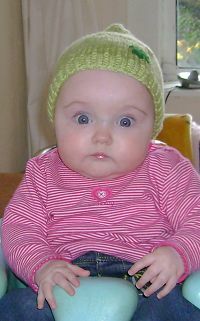 And before you ask, yes those are the handwarmers that I designed and knitted myself. Crystal is sure it's all part of a scheme to turn the heat completely off at our house.